Tim Burton’s Dark Shadows is an adaptation of the gothic-horror soap opera (1966 – 1971) of the same name. Burton’s rendition is in fact the second adaptation of the classic series as there was a remake series back in 1991 – Dark Shadows a.k.a The New Dark Shadows and Dark Shadows: The Revival Series, which ran for 12 episodes. I’m a huge Tim Burton fan, so needless to say I was immediately interested in Dark Shadows the moment I heard about it. As expected, Burton collaborates with the usual players – Johnny Depp, who plays the protagonist Barnabas Collins – an imprisoned vampire from the 1700’s who is awakened 200 years later in 1972 America to return to the dysfunctional Collin’s family in an effort to revitalize the once prominent Collin’s Fishery. Helena Bonham Carter – plays Julia Hoffman, a psychiatrist to the ten-year old Collin’s boy David, and Danny Elfman returns once more with a wonderfully gothic film score that compliments the subject matter wonderfully. I found the premise of the film to be quite fun and interesting, and enjoyed the usual amount of weirdness that comes with a Burton film. 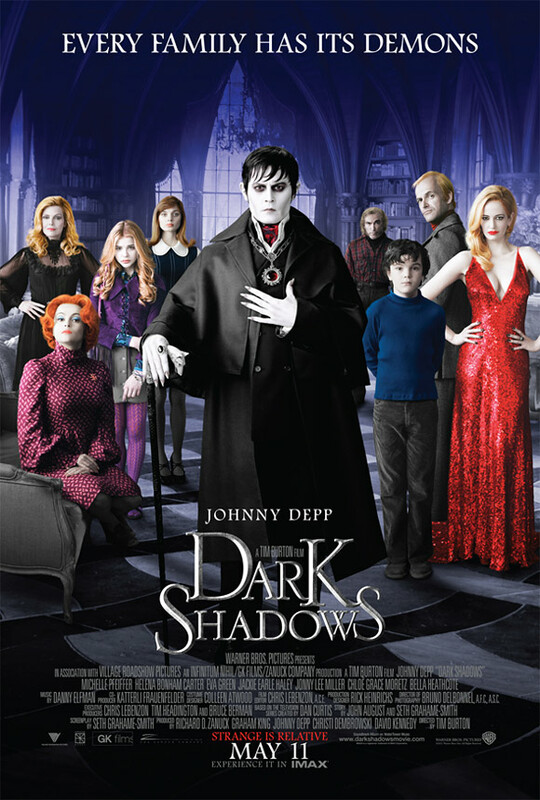 It’s also worth noting that Dark Shadows is a visually stunning film, with plenty of marvelous set pieces (such as the Collins Manor) and equally stunning are the characters and the acting, specifically Depp, who belts out clever quips and all manner of wordplay made funnier due to the character’s culture shock. What has confused me though, is the negative criticism that Dark Shadows has received, stating that the film was inconsistent or that it lacked focus, I find this to be untrue, as it uses the perfect Burton formula of spookiness and humour in what proves to be a highly entertaining film. However, perhaps it’s Burton’s formula that people tire of as opposed to the subject matter itself, but as always, it’s a given that his films won’t appeal to everyone given the creepy/comedy mash-up inherent with Burton’s style. Tim Burton succeeds once more with Dark Shadows as the film is highly entertaining and filled with enough oddness to keep Burton fans happy. Though this re-imaging of a classic series doesn’t offer too many twists and turns or much in the way of mystery, the linear approach of the film is overlooked by the visuals and the brilliant performances of Johnny Depp, Helena Bonham Carter and all those involved. As in most cases with Burton films, this is one for the fans.